A ‘QR’ (short for Quick Response) code is a so-called ‘two-dimensional barcode’ made up from black squares on a white background. QR Codes are usually contains URLs, Text or something like ID of Product, the QR Code technology is widely use in Android and Blackberry mobile phone, if you are Blackberry or Android user i think you must be familliar with this. The image bellow is some example of QR Code. There are many resources which can help you to generate a QR Code, in Ubuntu you can use application called 'qrencode', the qrencode could help you to generate your own QR Code complete with what size do you like (Large, Medium, or Small), a manual how to use a qrencode can completely find in here. 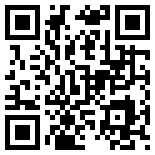 Anoher way, you can visit this website (http://qrcode.kaywa.com/) to generate your own QR Code. This article will discuss how to read a QR Code in Ubuntu, to read a QR Code in ubuntu we need library (program) named libdecodeqr-simpletest - libdecodeqr library's simple test program, this sample program can recognize the image file of the QR code of JIS X 0510 and ISO/IEC18004. Before we start, you should Install libdecodeqr-examples using apt-get or Synaptics Package Manager. Hit any key to end. The bold line above is 'exactly' the content of QR Codes inside of qrcode.png.